In a video recorded on Tuesday that has quickly gone viral, a tall black student is seen pushing paperwork off a teachers desk before attacking the teacher… all over a confiscated cell phone. The student was reportedly causing a disturbance and paying more attention to his cell phone than the teacher which resulted in the teacher confiscating the distraction. 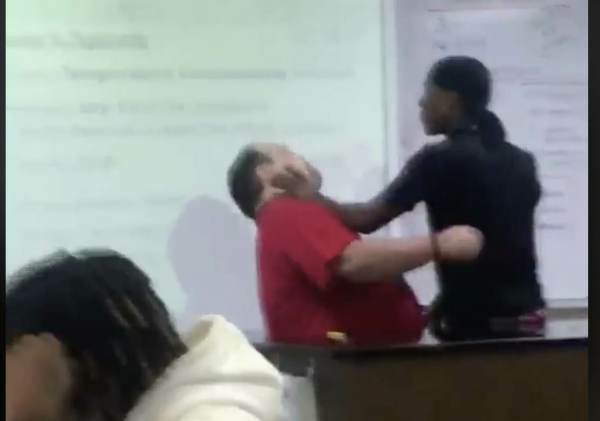 Describing this behavior as a “teachable moment” that was resolved with “hugging” is disgusting; perpetuating the idea that this student was simply having a bad day – which somehow warrants his assault on the teacher – is setting a dangerous standard. Personally, I was suspended for a half week back in high school simply for leaving school grounds during lunch hour to pick up food. If the new normal is an assault not warranting more than a “hug” then it’s no wonder why public education is failing our students. The student and his mom apologized, according to Cedar Hill ISD. He’s not being identified due to privacy laws, the district said. Soehnge says he doesn’t hold a grudge, adding that a classroom is a place for growth whether that be in academics or life. While some on social media have questioned whether Soehnge should have acted differently, the school says, he’s an example. Hunt runs a mentoring organization called the Dream Team. He said he wants to talk to the teenager in that video. “I was that child so I could relate,” he said. And he said Soehnge taught us all a lesson in remaining calm and showing the student compassion.